Some progress on the s. 2 motor. 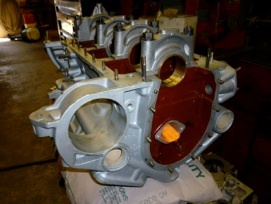 We are still waiting for the connecting rods to be made, but in the meantime, some work on the block has taken place. Walt Spak, working with his machinist in Pittsburgh, has sized some bearing shells for both the connecting rods and the main bearings. 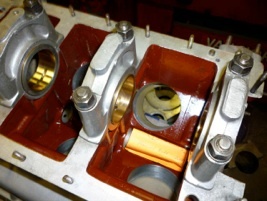 The connecting rod shells will go in the new connecting rods; the main bearing shells will go in the original Lancia bronze inserts, which have been bored out to accept them. This way, the original main bearing caps can be kept, and as long as the bronze shells remain fixed, all should be fine. The shot above is of the block, line bored through the bronze shells, now ready to receive the main bearing shells. 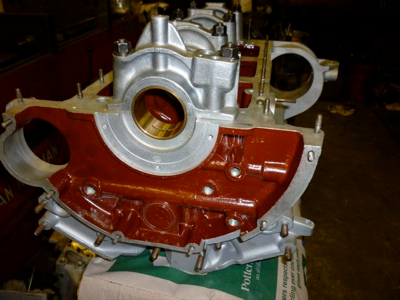 The crankshaft will be turned down on both the main and the conrod journals as well, but the conversion to shell bearings should be just fine. The oil pump will be upgraded to s. 3/4 spec, and the filter from mesh to paper. The inside of the block has also been repainted, and it does look pretty neat and fresh.